I swear by fresh herbs - they turn a meal from dull and boring into restaurant quality delicious. Whilst we do have a fresh herb garden just outside our back door, we do have a problem with bugs eating all of our herbs before we get a chance - or Kristy eats said herbs way too fast for the poor plants to keep up. Gourmet Garden have just recently launched their Lightly Dried Herbs and we are obsessed. We use them on a daily basis - whether they're sprinkled into pasta dishes, used in savoury muffins or even used to fancify toasted sandwiches (I have a killer recipe coming your way soon!). 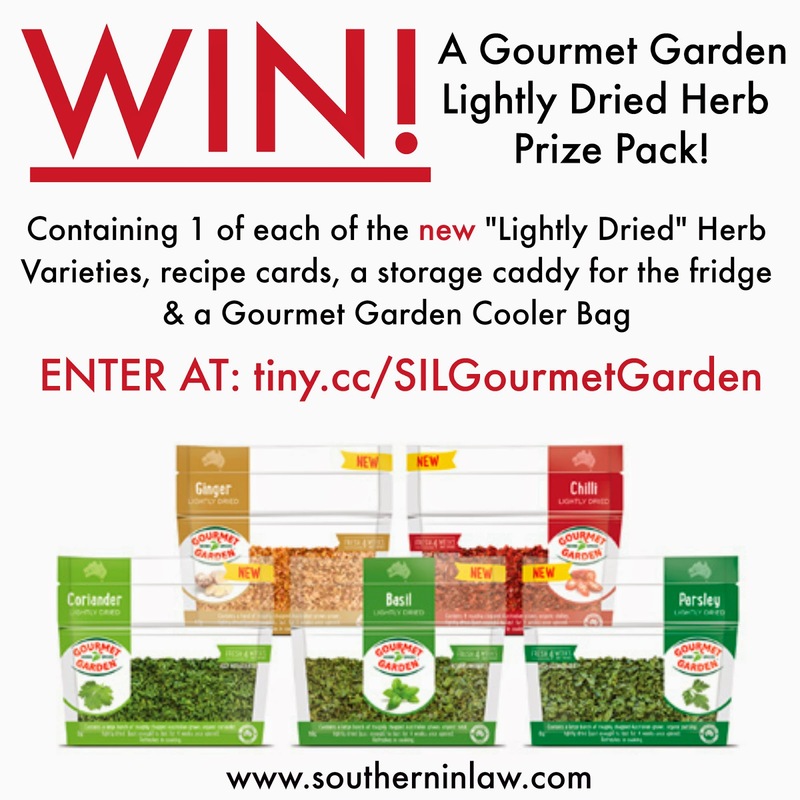 We wanted to share the Lightly Dried love by giving you guys a chance to win your own pack! This competition is open to Australian Residents and you have three chances to enter! You can enter using one or all of the options below - the choice is yours! "Follow" Southern In-Law on Twitter by clicking the follow button above and then tweet us, telling us about your secret weapon in the kitchen. Simply click the tweet button above and replace the xxxxx with your answer (be sure to use the #SILGourmetGarden hashtag. And your secret weapon doesn't have to be Lightly Dried Herbs like us - we want to know your personal tips! It could be adding some parsley to your Mum's Bolognaise Recipe or something totally unique like Basil Icecream! If you'd like, tag us in your picture of the dish too! Competition is open to Australian Residents and closes on June 19th 2014 at 11:59 PM EST. The best valid entries will be selected as the winner by Kristy and Jesse and notified via Facebook/Instagram/Twitter. Should the winners not reply within 14 days of contact, an alternate winner will be selected. 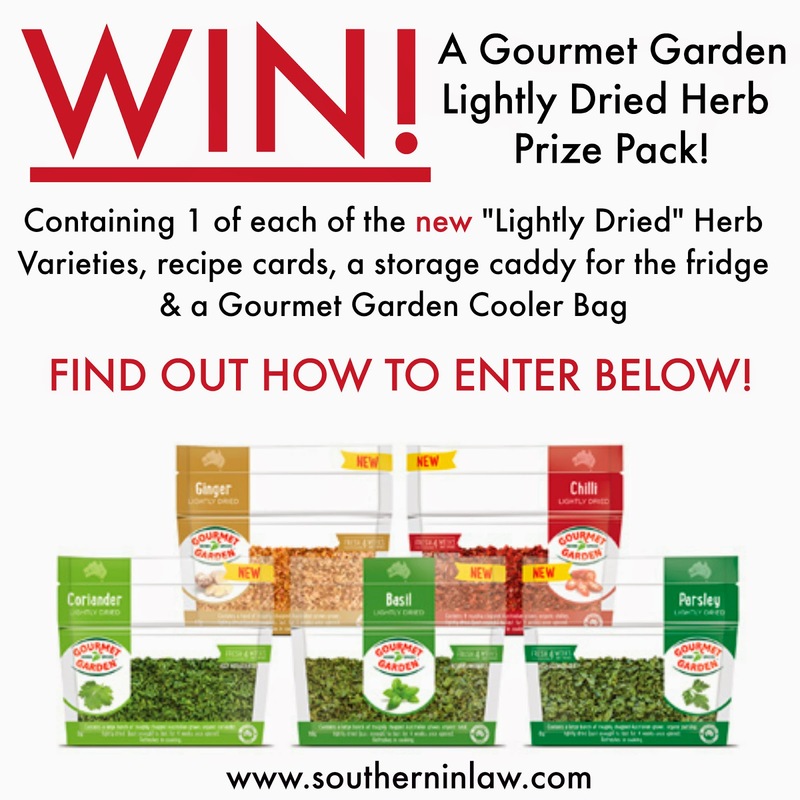 Please note: the winner must be a valid and current liker of the Southern In-Law Facebook /Twitter/Instagram page at the time of competition's close. Great giveaway! I love Gourmet Garden products. Our dinners wouldn't be the same without them! Would you consider including an option for those that dont use social media to enter? perfect. Wedding invitation card is one the important aspect of making any marriage special. Hmmm, to be completely honest I have absolutely no idea what's gone wrong! We've made this cake at least 20 times and have never had that problem. As for the gross spongey feel, the only thing I could think of that would have caused that is perhaps over mixing - but the green tinge I have no idea about! so I am thinking put a plant in it and make it a great teachers gift!